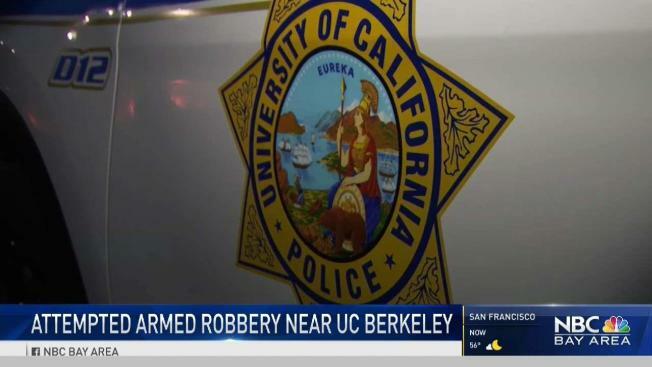 A suspected attempted armed robbery early Saturday morning in Berkeley has police on the lookout for a male suspect, University of California police said. University police received a report at 4:50 a.m. of an attempted armed robbery that occurred at about 4:30 a.m. at College Avenue and Channing Way in the city of Berkeley. Police said the victim was a student who fought off a suspect wielding a black handgun and who was able to escape into a student residence hall at unit 1. Police are describing the suspect as a man in his 20s with a light complexion and short dark hair, which may have been in cornrows. The man was about 5 feet 8 inches tall, 175 pounds wearing a black hooded sweatshirt with red writing on the front, acid washed jeans, black shoes and a handgun in his left hand. Anyone with information about the attempted armed robbery is asked to get in touch with the University of California Police Department's criminal investigation bureau. Police can be reached at (510) 642-0472 during business hours, except holidays, and (510) 642-6760 all other times.